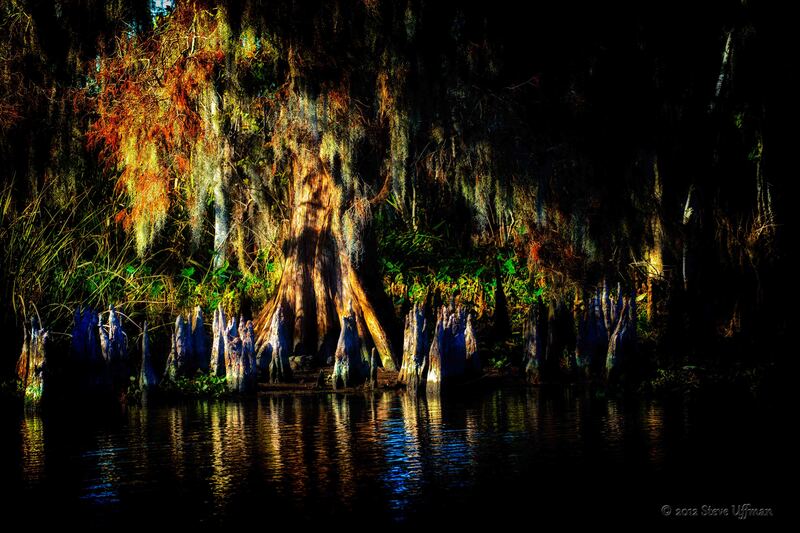 This image was taken deep in the mysterious Louisiana swamp lands not far from my home where dark swamps, draped in Spanish moss abound and sunbeams are rare. To some, the autumn beauty of a relatively solitary early morning sun ray piercing the darkness and highlighting the cypress swamps with as many colors as a rainbow is joy. Too other in Cajun culture, the darkness of the marsh holds many myths and mystery….. with visions of voodoo, snakes, gators, spiders and even tales of lost crazed marsh men. Another described it as something out of Hobbit land…. I tried to capture both the light and dark moods in a single image …not sure how this audience will react…might have to be Cajun to appreciate the contrasts between the light and the “darkness”. Although a non cajun described it as something out of Hobbit land…..
Canon 1dx, 70-300L, 1/400, f/8 ISO 800. handheld from a boat. Certainly show a place of mystery to me, but with the amazing colours reflected in the water it has an almost Christmas feel to it. Very nicely done Steve.